M12, a Sporadic Game from Magnolia Heights Research and Development, is a permutation puzzle (sometimes known as a "combination puzzle"). The goal is to start from a random position and return to the Home position where the number over each ball matches the small gray number next to the ball. Left and Right are opposites of one another, moving the circle of numbers one spot around the ring of 11 balls, but leaving the number on the top ball unchanged. Swap exchanges all the pairs of numbers over the pairs of balls of the same color. The Left, Swap and Right buttons in the middle of the ring make the corresponding moves. You can also spin the ring by dragging it with your finger, and you can Swap by flicking the top ball downwards. 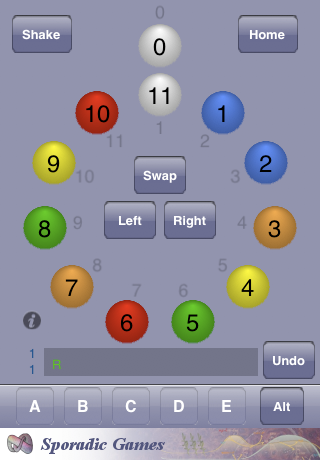 M12 will make a random puzzle for you to solve if you shake your iPhone or iPod, or if you hit the Shake button. All the buttons are described in more detail here. Each random puzzle is generated by a long sequence of random moves, so it is guaranteed to be solvable ... but that doesn't mean it will be easy! Here are a few suggestions. We'd love to hear from you, even if it is a bug report! Our email address is m12@magnolia-heights.com.